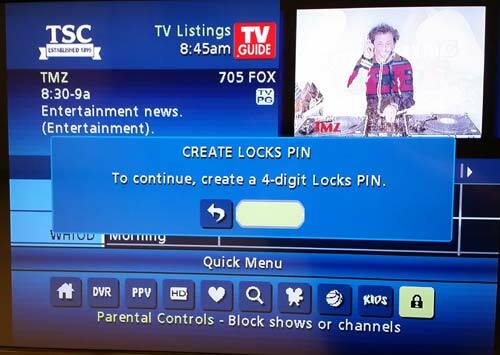 Press the right or left arrow key on your remote until the LOCK icon is highlighted and press OK.
You will be asked to enter a four digit PIN. This should be four numbers that you can remember or write them down where you can find them. Your set top will not play any programming that has Parental Lock without entering these numbers. Enter four numbers and then enter the same four numbers to verify and press OK.
You will now see a list of ways to apply Parental Locks. 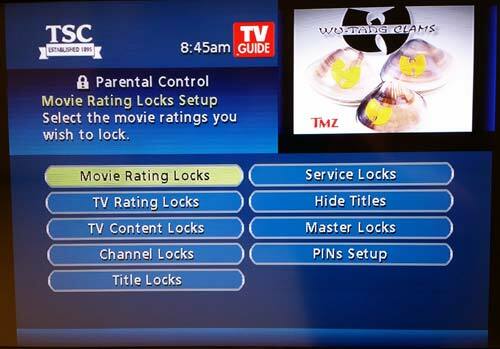 It is recommended that you use MOVIE RATING LOCKS or CHANNEL LOCKS and HIDE TITLES. MOVIE RATING LOCKS will show a list of movie ratings from G to Adult. Use the arrow keys on your remote and highlight your selection and press OK on your remote. Press LAST on your remote to go back one screen to make more changes. CHANNEL LOCKS will show a list of channels. Use the arrow keys on your remote and highlight your selection and press OK on your remote. Press LAST on your remote to go back one screen to make more changes. A movie, or station, that has been locked will show a lock icon in the menu next to the channel or the movie information. Finally, you can also use your arrow keys on your remote to highlight HIDE TITLES and press OK. 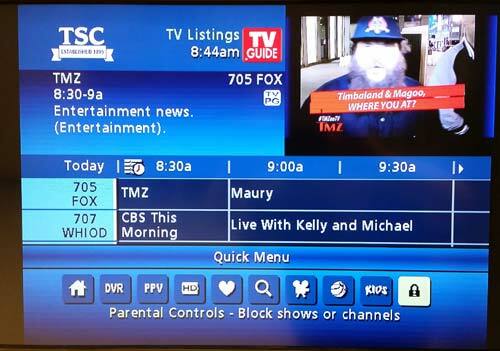 Highlight the titles you do not want to show up and press OK. Press the EXIT button on your remote to go back to your TV programming. 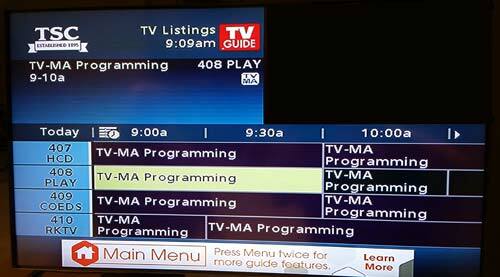 This will show the program rating, but will not display any details or picture on the channel unless unlocked.  Tune to the channel you want to watch. If the program is restricted by parental controls, a pop up box will appear on the screen requesting your PIN. Enter your 4 digit PIN. (Created in Step 3 above). If you entered your PIN correctly, the programming you requested will appear.